This unique symmetrical design of the True-Tandem 345 offers easy pulling and high performance seedbed preparation, even in the roughest of fields. Stubble resistant tires add to the disk harrow’s rugged profile. These optional stubble resistant tires are larger 340/55-16 on smaller models and 380/60- R16.5 on larger machine for enhanced flotation and reduced soil compaction. 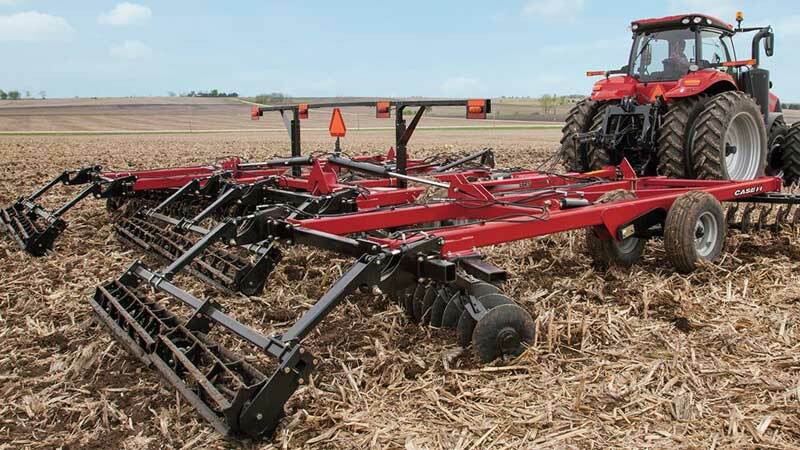 At working widths from 22 - 36 feet, the True-Tandem Disk Harrow is designed for primary and seedbed soil management, include uniformly distributed pull forces and exclusive Earth Metal blades. The 345 and 745 are the latest in a long line of excellent Disk Harrow performance you have come to expect from the leader in Disk Harrows: Case IH. Features include New LED lights, Stubble resistant tires, Earth metal blades, Rear reel basket, Welded cylinders for added reliability and pull through frame designed to stand up to tough use.